I received some sad news earlier this week. 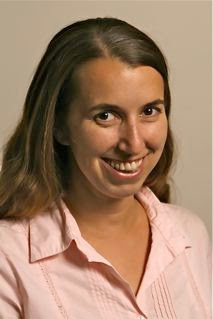 Daily Pilot ace reporter and columnist, Alicia Robinson, is moving on. Her last day a the Pilot will be next Friday, October 19th. Alicia, who has been a stalwart on the Daily Pilot for the past few years, has handled general reporting assignments and has covered the politics of Newport Beach and Costa Mesa like a blanket. I've always found her articles to be accurate and balanced, providing the news as it should be presented. She managed to give us in-depth coverage of issues without injecting her own views or emotional attachment to the story. She has been a real pro. Her "Political Landscape" column each week is widely quoted, particularly on local blogs. In addition to her print work, I, personally, enjoyed the recent video debate between combatants on both sides of the Newport Beach City Hall issue. I'm sure that was a lot of fun and it gave her a chance to spread her wings a little more. According to Alicia, she's moving to the Riverside Press-Enterprise, and will apparently be focusing on news of Corona and environs. You know Corona, right? It's the gateway to the Inland Empire. It's the place you never visit because it's on the way to somewhere else. About the only time most of us even think of Corona is when we're stuck in that traffic on the 91 Freeway. Usually it's mentioned in that cell call which goes something like this: "Sorry, Mom, the traffic is terrible and I'm stuck in Corona." Nonetheless, this is a terrific opportunity for a very bright and talented reporter. In the Press-Enterprise she'll be read by nearly four times the number of readers as the Daily Pilot. Granted, she may have to learn "909 Speak", but she can handle it. Alicia is the most recent excellent Daily Pilot reporter to move on to bigger things. You'll notice I didn't say "better", just bigger. I know we'll see her byline on big stories in the future. I wish her all the best as she takes her talent to the next level. Good Luck, Alicia. You have many fans and we'll miss you. Keep up the good work. 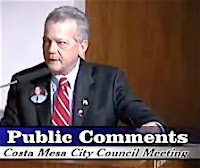 This morning Alicia Robinson reports in the Daily Pilot, here, that the City of Costa Mesa has spent $32,000 prosecuting the case against Benito Acosta so far, and the meter is apparently still running. She quotes City Attorney Kim Barlow as saying the case could be appealed to the State Supreme Court. Let me ask you - what is the return on investment in this case? Is it really worth $32,000 plus to convict Acosta of two misdemeanor charges and gain the fine of $1,000? I don't think so. It looks to me that what's going on here is that a petulant council majority, led by Mayor Allan Mansoor, is trying to "get even" with Acosta - to teach him a lesson for being rude and disrespectful before the council. HOW'S IT GOING TO LOOK? Here's another question for you. How do you suppose this is going to appear when presented in the federal civil rights case Acosta and the ACLU have filed against Mansoor, former Police Chief John Hensley and the city? How will it look when the court is told that the Orange County District Attorney's office declined to prosecute this case more than a year ago? How will it look when the court is told these charges were filed only after Acosta filed his case? And, how will it look if the city - in yet another boneheaded move - actually does appeal this case to the State Supreme Court? Add that to the obvious double standard Mansoor used on January 3, 2006 and it's going to look like the leaders of our city are inept, vindictive and prejudiced. In my opinion, this is exactly what happens when you elect small people to big jobs. Mansoor and his majority have consistently ignored the advice and counsel of each of their most recent top law enforcement officers - men who, between them, have had nearly a century of experience. This is the kind of trouble that lack of regard for folks with wisdom and expertise can create for the city. It is not unreasonable to assume that Acosta and the ACLU will prevail next spring, and with their success will come not only a huge financial hit to the treasury of this city, but to it's image, as well. I do not take joy in pointing this out, contrary to what some bloggers have said in the recent past. I'm not happy we have a city led by people without the vision to see the quagmire they are dragging us into. Their stubborn short-sightedness is going to cost us a bundle. Over the past week or so, as stories of this case and it's dismissal by the judge have dominated the news, some Daily Pilot bloggers have suggested that our young jailer/mayor should be recalled for this monumental gaffe. At that time I said it was a bad idea. It would cost the city a lot of money and, more important, would only serve to further divide us as a community. I must say, though, that if this plays out the way it appears that it might, and ends up costing us a lot of money and tarnishes our image among the community of cities, the voters of this city should weigh their choices next November very carefully to avoid perpetuating this kind of narrow-minded folly in the future. $32,000 AND COUNTING - WHEN WILL IT END? In my view, the city should cut it's losses. It should cease any further consideration of an appeal and immediately begin negotiations to settle the federal case out of court, if possible. The longer this drags out the worse we are going to look and the more it's going to cost. 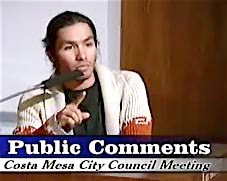 Over the past decade or more a group of long time residents of this city, the self -anointed "improvers", have preened, pontificated, postured and protested before council and commission meetings about how the city was declining - and clearly blaming that decline on what they perceived to be the reason - the Latinos among us. In recent years that description has morphed into "illegal aliens", because it struck a chord with the broader community. Yes sir, brown and illegal - how much worse could it get, right? When I first began writing about issues in our city a half-decade ago the hot button subject was the decline of the Westside. I've recently gone back and re-read some of my earliest contributions to the Daily Pilot, composed and published several years before I began my blog. I've also kept some of the responses to those essays, most of them written by members of that "improver" group. I re-read their complaints from a few years ago and hear them speak and read their words published more recently and must, at least in part, agree with some of what they say. They complain about the crime in their Westside neighborhoods - rightfully so. They complain about the shoddy condition of some of the dwellings in their neighborhoods - I would, too. They complain about overcrowding of homes and apartments, which tax our social and physical infrastructure - valid observations. Each of those things are certainly reason for concern. And each of them have solutions under our current laws and code enforcement regulations. And, each of this issues are not exclusive to the Latino community. If you read the Costa Mesa crime logs you will see Latino names, but you'll also see names that are not Latino. When you drive the neighborhoods of the Westside you'll certainly see some shoddy homes occupied by Latinos, but you'll also see many run down dwellings that are occupied by mostly older anglos - some of those very folks who complain about the condition of their neighborhoods. Many, if not most, of the folks who have become activists in the "improver" movement are people my age or older - much older. They've listened to the strident voices of the radical right, who promised quick solutions. These folks - part of Tom Brokaw's "Greatest Generation" and their children - are among those who founded this city and shepherded it's amazing growth over the past half century. But we, myself and those folks, don't represent the future of this city - we represent the past. I can tell you from personal experience, when you reach a certain age you're not particularly enthusiastic about change. You're happy to find some fog on the mirror when you breathe on it! The only change you want to see is a new date on the calendar each day. At my age and beyond you like to find your newspaper exactly where it should be, your slippers beside the bed and your robe within easy reach. You like to find the same products with which you've become comfortable for most of your life still available in the markets and drug stores. However, that's not the real world... life is change. The folks of the "improver" group don't like the change they are seeing in their part of town. They don't like the fact that they cannot communicate with some of their neighbors, nor share the same cultural values. I don't blame them for being uneasy. However, as I've said many times in the past, the Latino immigrants are the wave of the future for, at least, this part of our country. If we don't find a way to manage that wave we are destined to be overcome and drowned by it. I don't think anyone honestly believes that it is possible to round up and deport all 12 million (or more) illegal immigrants in this country. Even if it was possible, it certainly isn't practical from an economic standpoint. Instead of trying to find ways to expunge them from our city - and our country - lets find a way to make their presence work better for all of us. Many people in this country react in horror when the word "amnesty" is mentioned. They are offe nded that those "criminals" who crept across the border will actually be allowed to stay in this country - perhaps with a path to citizenship - while others wait patiently in line to become legal residents. They scream at the top of their lungs that amnesty should not happen - that it will only encourage more illegal immigration. Well, with the open borders that we have now, that's probably true. In my view, once our borders are secured, a form of earned amnesty should be adopted. Back taxes and other fees should be imposed to those eligible and crime-free. I have gotten to know many people who took advantage of amnesty the last time it was offered. Without exception, they are honest, hard-working, cheerful, family-oriented people, grateful for the opportunities available to them. They jump in their cars and head to distant places - Portland, Chicago, etc. - to visit family members, just as my family used to do in the middle of the last century. They are proud of their heritage, just as my parents and grandparents were. They encourage their children to achieve good grades and attain higher education so they can make a better life for themselves and their families - just as my parents and grandparents did. These folks have become valuable members of our society - just as my parents and grandparents were. Many so-called "improvers" have used low test scores in schools which educate the children of Latino immigrants - most of those kids are American citizens like you and me, by the way - as an example of the financial drain of the immigrants on our society. Well, recent upticks in some of those schools have demonstrated that those children, who may be brown, are certainly not dumb. They may not speak English in the home, but they certainly do speak it in school, and their test scores demonstrate their comprehension. These are, for the most part, cheerful, bright children who are thriving in circumstances most of us cannot imagine. The so-called "improvers" better wake up. These children - the ones whose parents they are so eager to castigate, incarcerate and deport - are going to be registered voters in the very near future. If they think Benito Acosta gave them nightmares with his activism, they had better renew their valium prescription, because during the next decade these kids are going to begin voting in large numbers. They and their anglo peers, not you and me, are the future of this city, so we'd be much better off trying to find ways to integrate them into the mainstream of our society than to waste precious energy and resources trying to alienate and anger them. Our present leadership seems to advocate an "enforcement only" policy toward our gang problem. That's a huge mistake, in my estimation. Any program that has no element of intervention included is doomed - recent history in Los Angeles has demonstrated that for us. You'd think our young jailer/mayor - a law man - would know that, wouldn't you? In my view, it's critical that we work harder to educate, motivate and integrate the children of the immigrants among us. If we don't do a better job of providing alternatives to gangs, that insidious sub-culture will take over large numbers of our youth, just as they have in other parts of Southern California. LET'S MAKE I T WORK! Things change - got it? Those geriatric activists my age will not be around to harvest the bitter crop they are planting, but your children will. It's time to get our collective heads out of the sand and find solutions that will work instead of trying to turn the clock back a half century, because that's not going to happen. The Benito Acosta Trial - a gift that keeps on giving - or taking, depending the side of the table you're on. I noticed on the city web site that there has been a special City Council meeting called for Tuesday, October 9, 2007, which will immediately follow the scheduled Study Session for that date. 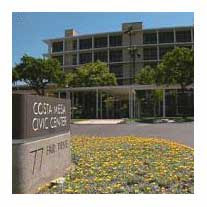 This will be a "closed session" meeting to discuss the recently-dismissed case of Costa Mesa v. Acosta. I hope they've got the metal detectors hooked up, just in case someone decides to throw themselves on their sword for the mistake made by the attorney for Jones & Mayer last week. Since this is a closed session, we mere mortals will likely have a very difficult time learning the result of the discussion. Is it just me, or does it seem that this council spends an awful lot of time in closed sessions recently? I suspect, as the old phrase goes, "We ain't seen nothin' yet!" With the federal civil rights case looming in the second quarter of next year, I suspect we'll be seeing many, many more closed sessions as our elected "leaders" try to figure out how to extricate themselves and our city from that particular tar pit.